Permission to change and develop in the Life Sciences! • Enjoy a unique environment to meet and gain input from all stake holders on industry direction, challenges and solutions. • Experience hands on demonstrations of automation equipment and packages. Mike Train, Executive President with Emerson explains their focus under the attentive eye of European President Roel Van Doren. This correspondent was aware of the NIBRT facility but had very little idea of what it was real function or its relevance to Irish industry. This was an opportunity find out. Further looking through the programme two things became apparent. One was the calibre of personnel speaking from the Emerson organisation and then the application rather than product orientation of the various sessions. It proved to be a very interesting two days. Day 1: Working together towards a common future. 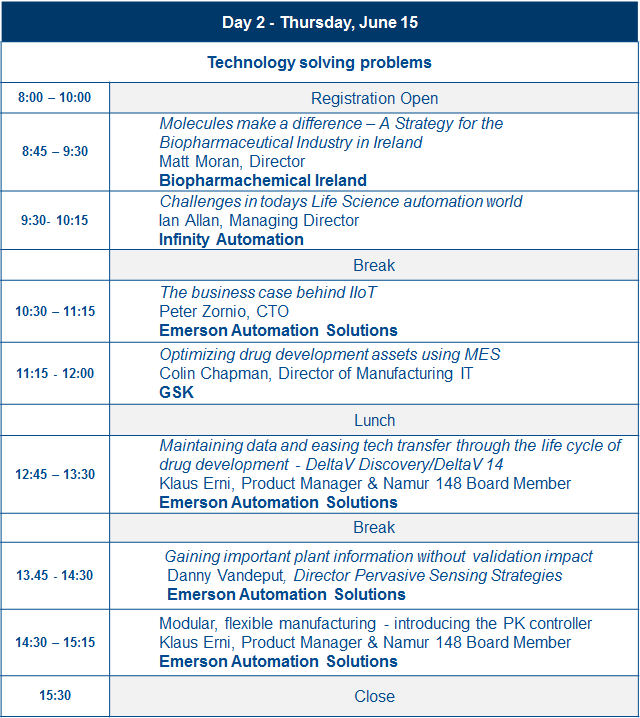 Presentations from NIBRT, Industrial Development Authority (IDA), GSK, Alexion, Zeton, Novo Nordisk and Emerson Automation Solutions. After a short welcome fro Emerson Europe President, Roel Van Doren, the CEO of NIBRT, Dominic Carolan, outlined the foundation and raison d’etre of the organisation. It is a training and research in the area of bioprocessing. It is located in a new, world class facility in Dublin (IRL). As medical science advances “simple” chemistry, while still essential, is not fully capable of solving all health issues – Pharma versus Biopharma. Bioprocessing is a specific process that uses complete living cells or their components (e.g., bacteria, enzymes, chloroplasts) to obtain desired products. Thus this facility exists to support the growth and development of all aspects of the biopharmaceutical industry in Ireland. It is purpose built to closely replicate a modern bioprocessing plant with state of the art equipment. Making Ireland ready – a good news story. Dr Chantelle Keirnan, Scientific Advisor with the Industrial Development Authority (IDA), described the far-seeing intuitive initiative to look at bioprocessing “before it was profitable or popular!” This state body is responsible for the attraction and development of foreign investment in Ireland and had been extraordinarily successful in attracting nine of the top ten pharma companies to set up manufacturing processing plants in Ireland. They considered at the turn of the century that bioprocessing was the way that life science was going and took steps to ensure that Ireland was ready. One of those steps was the provision of Government funding of NIBRT. Many of the delegates – in excess of one hundred attended some from other countries – donned white coats and took the opportunity to tour the impressive facility during the event. It includes a purpose-built, multi-functional building which replicates the most modern industrial bioprocessing facility. Some idea of this facility may be gleaned from their website here. This is a good news story. How often are decisions of state organisations regarded, not entirely without justification, with a jaundiced eye? Those that are good are “oft interréd with their bones!” The vision that saw this development in industry and the individuals who having caught the ball ran with it and brought it so successfully to fruition is worthy of equal attention and praise. We then had a series of speakers from the industry, people who get their hands dirty so to speak in actual processing speaking of their experiences and challenges. Speakers from GSK and Novo Nordisk explored areas like partnership, legacy issues, building on or expanding existing plants, saving energy, wireless. There was some discussion on the cloud and its advantages and just how vulnerable it might be to security breaches. Peter Zornio, Chief Technology Officer with Emerson gave their philosophy in meeting the demands of “Life Science Visions.” He lauded the various discussion groups such as the Biopharma Operations Group in helping how to keep up to date with technology and fostering new ideas. We are on a digitizing journey. Moving from manual and paper to digital recording and control. 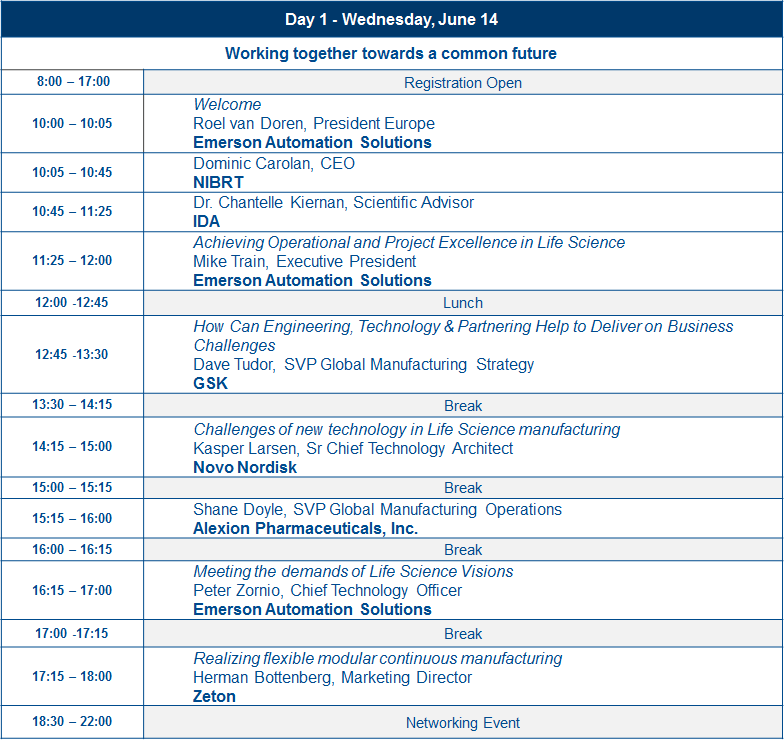 Presentations from BioPharmaChem, GSK, Infinity Automation and Emerson. The day started with a presentation on modular flexible manufacturing – introducing the PK Controller and a little later in the day there was an exposition on DeltaV Discovery/DeltaV 14 in maintaining data and transferning and easing technology transfer through the life cycle of drug development. We might perhaps use the words of the Bard of Avon, “The fault, dear Brutus, is not in our stars. But in ourselves….” The “gifts” are there. The Technology is there or on the way. Let’s own these gifts and make them our own. Dominic Carolan was appointed CEO of NIBRT in April 2015. Mr. Carolan previously held senior roles in Mallinckrodt (Dublin), Genzyme (Waterford), also Genzyme (Corporate) where he was Senior Vice President of Manufacturing, and in Sanofi, where he headed their global network of Sterile Injectable Lyophilisation sites. He has successfully lead the startup of two significant Pharma & BioPharma facilities in Ireland and has a proven track record in operations leadership and in attracting and developing the talent required to deliver long term success. A graduate of UCD in Chemical Engineering, Mr. Carolan was Chairman of BioPharmaChemical Ireland from 2008-2010. Dr. Chantelle Kiernan joined IDA in September of 2009 and is responsible for attracting research related foreign direct investment for Ireland. Chantelle has responsibility for the Multinational research portfolio – spanning Pharmaceutical, Biotechnology, Medical Device, Engineering Food services industries. Chantelle has spent her career equally dispersed between academia and industry. She holds a PhD in Immunology from Trinity College Dublin in the area of immunomodulation and continued her academic career with a Post-Doctoral fellowship in Harvard University, Boston. Chantelle is currently undertaking an MSc in International Business law. She has spent almost fifteen years in industry. In her current role as Scientific Advisor for the IDA, she has been integrally involved in attracting and securing large scale R&D foreign direct investments for Ireland. Michael H. Train leads the Automation Solutions business of Emerson, which posted sales of $10.2 billion in fiscal 2015. Train began his career with Emerson in 1991 as an international planner, then took on additional responsibilities in a number of executive posts that included serving as President of Emerson Japan and Korea, VP of Corporate Planning, President of Emerson Process Management Asia Pacific, and President of Emerson’s Rosemount business. He was most recently President of Global Sales for Emerson Process Management, responsible for sales, service, support, and customer satisfaction for all products and services across five world-area organizations. In that role he was also part of the leadership team that drove strategic initiatives and investments for the entire business group. Train earned a bachelor’s degree in electrical engineering from General Motors Institute and an MBA from the Johnson Graduate School of Management at Cornell University. He currently serves on the management school’s advisory council and was a 2008 Eisenhower Fellowship recipient. Dave joined GSK in 1992 at Worthing as a PhD Chemist from Glasgow University. He has over 20 years’ experience with the company carrying out a number of Technical, Compliance and Manufacturing leadership roles. In 1997 he moved to Irvine to take up a lead chemist role before coming Quality Control Manager in 1998. He joined the site leadership team in 2001 to run Technical Development before moving to manufacturing as Actives Production Director in 2005. During this time he completed a Masters degree in Manufacturing Leadership at Cambridge University. In 2007 he moved to GSK House to work on a central network re-structuring project before becoming Site Director at Montrose in October 2008. At Montrose, he led the transformation of the site to manufacture over 12 products for GSK including a major investment programme. In 2011 he was appointed VP Primary Supply Chain with responsibility for global Active Pharmaceutical Ingredients (API) manufacture and supply, a network of GMS sites across the world including facilities in Asia and Europe. In 2017 he was appointed VP Head of GMS Strategy with responsibility for manufacturing strategy, deployment of strategic programmes, performance management and advocacy. He plays an active role with a number of Governments and is currently co-chair of the Life Sciences Scotland Industry Leadership Group. Dave is also a member of UK Chemicals Industry Association Council and Board. Dave is married with 4 children and lives in Troon, Ayrshire. He enjoys all sports, particularly football, is a keen reader of Scottish history and does cooking to relax. As Chief Strategic Officer for Emerson Automation Solutions, Peter has responsibility for overall coordination of technology programs, product and portfolio direction, and industry standards across the Automation Solutions group. He has direct responsibility for the product definition and development organizations for control systems and software products. He has been at Emerson for 10 years. Prior to Emerson, he spent over 20 years at Honeywell in a variety of technology and marking roles, most recently as overall product management leader. Peter holds a degree in Chemical Engineering from the University of New Hampshire. PDEng. Ir. Herman Bottenberg is a chemical engineer with 15+ years of industrial experience, along with two years of Post academic work on Plant Design. He worked for 17 years at Zeton B.V. in The Netherlands, with five years of experience in project engineering and project management. The last 12 years he has been active in business development, sales and marketing. Since 2016 Herman is also responsible for the Marketing and Sales group at Zeton B.V. Herman has specialised in transformation of processes from batch to continuous, process intensification and modular processing plants for pharma and chemical industry. Matthew Moran is Director of BioPharmaChem Ireland. He graduated in Chemistry at Trinity College Dublin in 1980 and in Chemical Engineering at University College Dublin in 1981; he holds an MBA also from University College Dublin (Smurfit School of Business). He worked for over ten years in the pharmaceutical industry where he held a number of management positions both in active ingredient and dosage form manufacture. He is a member the European Chemical Industry Council (CEFIC). Matthew Moran is a Board member of the Active Pharmaceuticals Ingredients (API) Committee of CEFIC (CEFIC/APIC) and The European Association for Bioindustries (Europabio) BioPharmaChem Ireland represents the interests of the biopharmachem sector in Ireland. CEFIC/APIC represents the European API Industry. Europabio represents the European Biotech Sector. Currently the Managing Director of Infinity Automation, a relatively new company carrying out Automation & MES Consultancy, Strategic Planning and Major Program/Project Health checks, with blue chip Global Life Science companies and Strategic vendors that support that Industry. Formerly Ian was the Global Head of Automation & MES with Novartis, where he was responsible for the Manufacturing Automation Strategy and MES Program within Technical Operations in the Vaccines division. Prior to that he worked for GSK as Global Automation Director responsible for Automation, Process Control and MES across 73 sites worldwide. There he led a team that developed a library of Emerson DeltaV modules to be deployed in multiple Bulk API sites across the world, as well as developing a blueprint for MES integration and Network delivery of Electronic Batch Records. Prior to that he held several roles in GSK within the Engineering and Automation departments. Ian started his career with IBM as a junior engineer when computers were a little bigger than they are today and holds a BSc in Electrical & Control Engineering from Strathclyde University. He is currently facilitating GSK’s Global Automation Steering Team and is leading the Digital Factory Automation workstream for a new Hybrid Manufacturing platform with the first instance being delivered in GSK Singapore Jurong site. Colin Chapman is a Chemical Engineer with nearly 20 years experience in Life Sciences with GSK. Colin’s career has spanned across process engineering & automation, operations and new product introduction in both commercial manufacturing and clinical supply chains. In his current role as Director of Manufacturing IT Colin has successfully led the introduction of Manufacturing Operations Management across the clinical supply chain driving business process re-engineering and global workflow automation using technologies such as Syncade. GSK’s continuing program focuses on three value drivers, Compliance, Business Intelligence and Productivity. Klaus started his Emerson career in 2003 in Germany, where he was working as a Technical Manager for Key Accounts before he transferred to Austin, TX to become the DeltaV Hardware Product Marketing Manager. In 2015, he went back to Europe and took over another Global Role, being now the Technical Consultant to some major Strategic Accounts. While in Germany with Emerson, he was responsible for the technical aspects of the DeltaV Systems during the Sales and Implementation Phase, as well utilizing the latest Hardware and Software features while upgrading and expanding Systems on Key Customer sites. Prior to Emerson, Klaus was with the Hoechst AG, he did several Engineering projects with various PLC and DCS and SIS Systems and was as well a RS3 System User. The (Industrial) Internet of Things (IIoT) is revolutionizing the way we live but it also provides many new challenges to the industry. This can create confusion, uncertainty – combined with fuzzy statements – and different opinions. My great passion is to bring clarity in the Industrial Internet of Things and what benefits it can bring for you. I help industries to find the right perception of IIoT, how sensors can maximize profit, reduce downtime and bring the ROI into the IoT. Being already 23 years with Emerson I have assisted many types of industries on their way to Top Quartile Performance. This includes amongst other trainings, workshops, audits and implementing solutions. You are currently browsing the archives for the Life Sciences category.